This was the second time that I have attended a “De Avond van de Filmmuziek” (Evening of Film Music) concert in Amsterdam. It is the most prestigious film music concert that we have here in the Netherlands, held in our most famous music venue “Het Concertgebouw”. Due to its popularity, this concert was performed three nights in a row. One of the performances would be recorded for television and judging by all the cameras around the hall this happened to be on our night. Just like the venue, not much had changed since the last concert: the orchestra of the evening was again the Metropole Orchestra, conducted by Vincent de Kort and the hosts, Jan Versteegh and Dominic Seldis from the United Kingdom, returned this year as well. The first half started with “Also sprach Zarathustra,” which is a traditional opener for a concert like this. The venue has an organ, which was a great addition to this piece. Of course it is possible that they used a synthesizer instead, but I did not see one on stage. Afterwards, we could listen to the piece “Arrival of the Birds” used in A Theory of Everything. This movie contains beautiful music composed by Jóhann Jóhannsson, who passed away recently, that they did not use. I understand that it is not possible to play his music on such short notice, but personally, I would have appreciated a small mention of him, which did not happen. Pianist Iris de Hond came on stage to play two pieces from Intouchables, written by Ludovico Einaudi, which were performed beautifully by De Hond and the full orchestra. I do think it was a bit of a missed opportunity to include the orchestra in this piece: the stand-alone piano piece is just gorgeous and has more impact with just the piano. Next to well-known pieces from Interstellar (of course with organ), Forrest Gump, and Up, the orchestra also played music from the Dutch movie Zwartboek and two pieces from Magnolia, where singer Ellen ten Damme sang a beautiful rendition of Aimee Mann’s “Wise Up”. The orchestra is well known for its quality in light music and their support for Ten Damme’s voice was just beautiful. Next to De Hond and Ten Damme they had also invited the Nederlands Concertkoor, consisting of approximately 80 persons. They performed two pieces in the first half. Music in Het Concertgebouw is not amplified and as soon as the choir started singing “Navras” from the movie The Matrix Revolutions, goosebumps appeared. It is such a powerful piece and was executed perfectly. The second piece, “Conquest of Paradise” from 1492: Conquest of Paradise, was also very well done and the goosebumps remained all the way through. The second half started with host Seldis taking up the baton to conduct two jazz pieces from La-La Land, a natural fit since the orchestra has a considerable number of Jazz musicians in its ranks. The trumpet and trombone players were allowed to stand to show the audience what they were capable of. This half of the concert contained music from more recent movies, like The Imitation Game, Moonlight (with a violin solo played by Diamanda Dramm) and one of my favorites of the night: Spider-Man: Homecoming. But they also played music from older movies like Revolutionary Road and of course Star Wars. The choir got another opportunity to sing in this half as well with music from Elizabeth: The Golden Age. Composer Craig Armstrong is known for writing powerful choir pieces and the choir combined with the orchestra made the goosebumps reappear. They had also included “O Fortuna” from Carmina Burana in the program, which is officially not film music, but that is easily forgiven with a fantastic choir like that. To the surprise of the audience, the host Versteegh started to sing “City of Stars” from La-La Land together with Ellen ten Damme, as the first encore. Traditionally, the concert concluded with “Raiders March” from Indiana Jones. 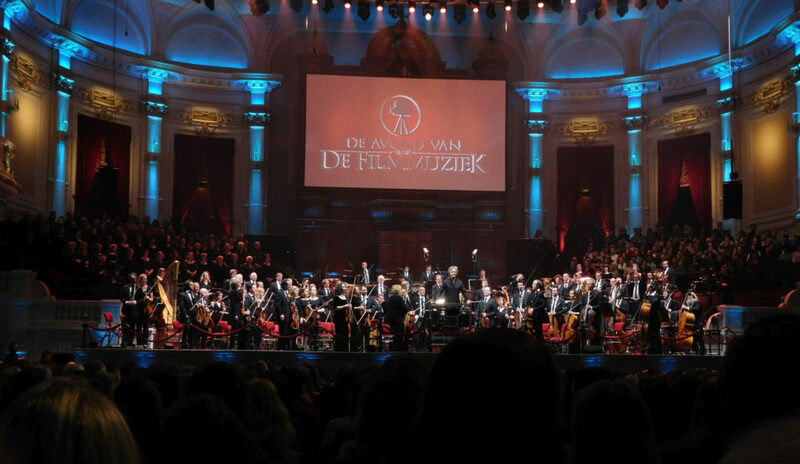 It was the fifth edition of “De Avond van de Filmmuziek” and the orchestra, guests, and choir were wonderful. We can be proud of having musicians like this in the Netherlands. 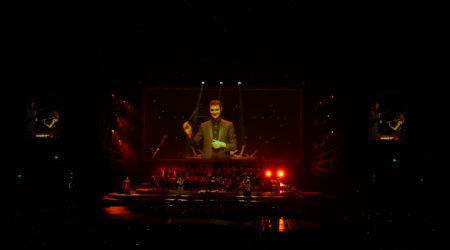 The concept of the program is perfect for introducing a large crowd to film music because it is kept light and made entertaining by the two hosts. For every movie corresponding scenes were shown on a screen, helping the audience to relate the music to the images. It also helps to have one of the best orchestras of the Netherlands together with a great choir performing in the best concert venue of our country. Listening to film music without amplification is such a treat. I did miss music from Dutch composers this year though. Last year they had music from Tom Holkenborg, Rogier van Otterloo, and Merlijn Snitker, but this year they had only included music from Zwartboek, composed by Anne Dudley from England. 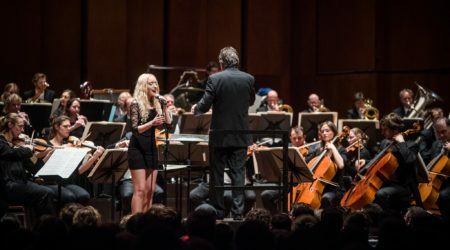 We have quite some successful Dutch composers, and I would have loved for the organizers to put some of their music in the spotlight during an event like this. In spite of this, I was fortunate to be able to listen to great executions of, for example, Spider-Man: Homecoming, The Matrix Revolutions, and other great pieces. At the end of the evening, they announced that next year there will only be a single concert but in a much larger concert hall to celebrate their five year anniversary. This means that a lot more people can enjoy film music, which is a great thing, but that also means that they will leave the magnificent Concertgebouw behind for a venue where amplification will be necessary. Let us see what next year brings.